ALL YOU NEED TO KNOW ABOUT DEHYDRATION: FROM THIRSTY TO A&E! One of the simplest, yet most important pieces of advice our private doctors at London Doctors Clinic constantly reiterate to patients is to stay hydrated. When you’re feeling under the weather, you might not feel up to eating and drinking much, but this can lead to dehydration, which will not only make you feel more miserable, but may hinder your recovery! Today, we focus on what happens when you don’t drink enough fluid and become dehydrated. The average adult needs between 1.5 and 2 litres of fluids per day to function well. Dehydration is when we use or lose more fluid than we take in, leaving our bodies struggling to carry out all the processes that keep us feeling healthy and happy. If we don’t replace the lost fluid, dehydration will result. It can be mild, moderate or severe, depending on the circumstances in which it occurs. 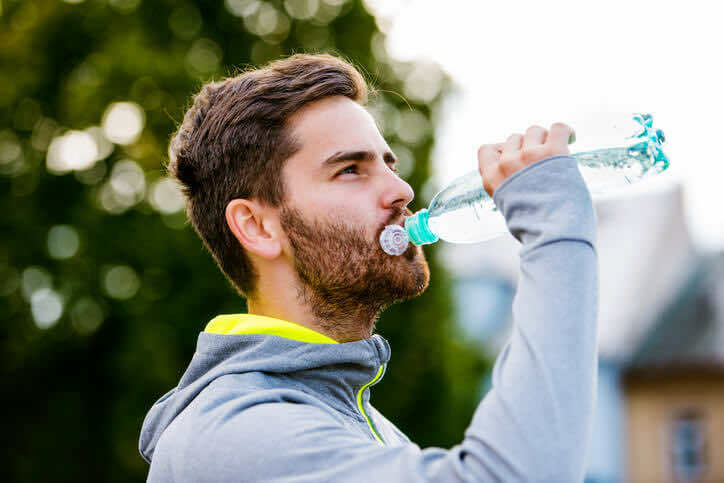 Many people are already dehydrated by the time they feel the common symptoms of having low bodily fluid, so it’s important to learn how we can keep ourselves well hydrated! You are also more likely to be at risk of suffering dehydration if you are an older adult or a younger child, or have a chronic illness that leaves you less well able to cope with small losses of fluid. There are lots of very simple things you can do to prevent dehydration, and many of these measures will not only reduce your risk of becoming dehydrated, but benefit your overall health as well! 1. Regularly sip plain water throughout the day. If you find it difficult to drink unflavoured water, it can easily be jazzed up by adding a squeeze of lemon or lime juice, or by adding some sugar free flavoured squash. 2. Teas, herbal teas and coffee’s also count towards your daily fluid intake, but beware of drinking more than several cups per day, as these drinks are caffeinated and can interfere with restful sleep. 3.Snack on foods with a naturally high water content – most fruits, vegetables and soups are great choices. 4. Avoid drinking too much alcohol. Alcohol dehydrates your system, and if you drink regularly, there is a chance you may be dehydrated, so take it easy. 5. If you are ill, if the weather is warm, or if you are especially active, remember you may need to drink more. 6. Continue to hydrate yourself in cold weather – you may not be as active or as thirsty in winter, but you still need to drink sufficient fluids. 7. Pace yourself – your body may struggle to handle large volumes of fluids at one time, so it is preferable to sip regularly throughout the day rather than drink massive amounts of water at one time. 8.Use your urine as a guide to tell you if you are drinking enough – a reduction in the number of trips to the bathroom, or urine that is darker than the colour of straw can be an indication that dehydration is the problem. Teas, herbal teas and coffee’s count towards your daily fluid intake! By sticking to the tips above, you can almost always ensure that you stay well hydrated and reap the benefits of this healthy habit. However, sometimes, such as in periods of illness, you may become dehydrated despite your best efforts. In cases of mild dehydration, resting and drinking extra fluids for 24 hours is usually enough to make you feel better. A sugary drink or salty snack can help you to replace salts and sugars that have been lost when you become dehydrated. Oral rehydration sachets (usually powders which are added to water) are available from your local pharmacy, or can be prescribed by your Doctor. In times of more severe dehydration, medical treatment may be required, and the type of treatment will depend on your age, the severity of the dehydration, and it’s cause. Children and adults who are severely dehydrated are likely to be treated in a hospital accident and emergency department. Salts and fluids delivered through a vein (intravenously) are absorbed quickly, and should help you get back on track in no time. If you suspect either yourself or a loved one is dehydrated, it’s best to seek the advice of a GP, who can assess whether there is any treatable cause of dehydration, give advice for symptom management, and assess whether further treatment (such as intravenous fluids) are required in a hospital setting. At London Doctors Clinic, our private GP’s are more than capable of advising in this situation – and with 12 private clinics located across central London, we should never be too far away when you need to find a GP. If you’re acutely unwell with severe dehydration, however, it may be best to go straight to A&E for immediate treatment.